Google Wi-Fi reduces the dead zones or buffer zones because it is a 2×2 Wave 2 802.11ac Wifi device . It’s a best replacement of current router as it covers up to 1,500 sq. ft.
We can setup quickly the device app that can allow us to see what’s connected, prioritize devices, and even pause the Wi-Fi devices for specific purposes. It put us in control of our network by prioritizing them for better performance, i.e we can prioritize it for faster speed. The app also provides much more insights to get the most of Google Wi-Fi , for example we can see what’s connected to our network and how much bandwidth the devices using . Through this app we can create separate network for guests and can test network connection speed on the network. Using a network manager, we can monitor and manage our Wi-Fi network and can make changes such as Wi-Fi network name and Passwords. 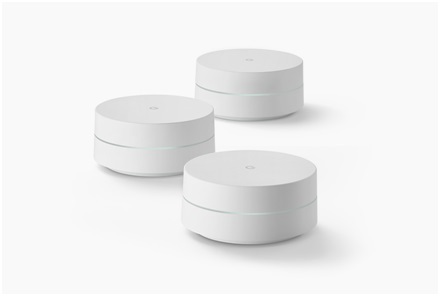 The excellent with Google Wifi is that it is easy to use and speedy set up. It has powerful Wi-Fi coverage and fast speed. It is much more cheaper than other mesh Wi-Fi systems. Google Wifi is simply the best Wi-Fi system in the market. As it is uses beamforming technology , we can extend fast internet connectivity to every corner of our premises. Google Wi-Fi is the intelligent version of previously presented OnHub .